My name is Andrew Dessler and I am a professor of atmospheric sciences at Texas A&M University. I have been studying the atmosphere since 1988 and I have published in the peer-reviewed literature on climate change, including studies of the cloud and water vapor feedbacks and climate sensitivity. In my testimony, I will review what I think are the most important conclusions the climate scientific community has reached in over two centuries of work. Let me begin by describing some important points that we know with high confidence — and how that has led me to personally conclude that climate change is a clear and present danger. By this I mean by this that we are presently in the midst of an overall increase in the temperature of the lower atmosphere and ocean spanning many decades. This can be seen in Figure 1, which shows the global average surface temperature, and Figure 2, which shows the heat content of the ocean (both figures plot anomalies, expressed in degrees Fahrenheit). A mountain of ancillary data supports these observations of warming: e.g., satellite measurements of the temperature of the lower atmosphere, loss of ice on the planet, observations of sea level rise. Fig. 1. Global annual average temperature anomaly in °F; the gray line is the annual average and the black line is a smoothed time series. Data are from the NASA GISS Surface Temperature Analysis [Hansen et al., 2010], downloaded from http://data.giss.nasa.gov/giste mp/. Other analyses show nearly identical results. a. Humans have increased the amount of carbon dioxide in the atmosphere from 280 parts per million in 1750 to 400 parts per million today. Methane levels have more than doubled over this period, and chlorofluorocarbons did not exist in our atmosphere before humans. b. The physics of the greenhouse effect is well understood, and it predicts that the increase in greenhouse gases will warm the climate. Fig. 2. Ocean temperature anomaly in °F of the entire ocean. Anomalies are calculated relative to the 1970 - 2000 period (data are from Balmaseda et al. ). 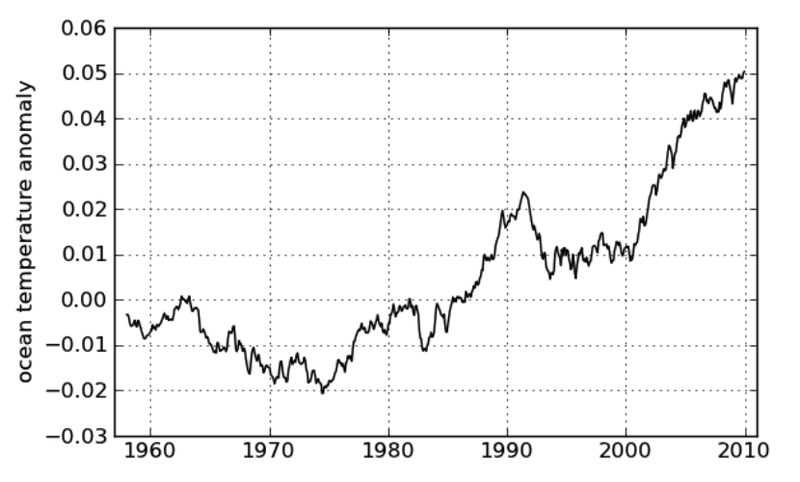 c. The actual amount of warming over the last century roughly matches what is predicted by the standard model1 of climate. This is shown in Fig. 3 . 1 Following particle physics and cosmology , I’ll refer to the mainstream theory of climate science as the standard model. A climate model is a single computational realization of the physics embodied in this standard model. d. Reconstructions of paleoclimate data over the last 60 million years show that changes in atmospheric carbon dioxide exert a strong control on the climate system. e. There is no alternative explanation for the recent warming other than an enhanced greenhouse effect due to human activities. Fig. 3. 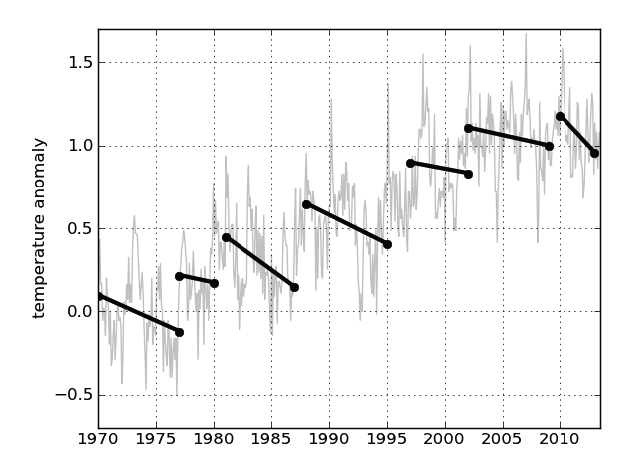 Global mean surface temperature anomalies from the surface thermometer record (gray line), compared with a coupled ocean- atmosphere climate model (black line). The model includes natural forcing and human greenhouse - gas emissions, aerosols, and ozone depletion. Anomalies are measured relative to the 1901 - 1950 mean. Source: Fig. 3.12 of Dessler and Parson , which was an adaptation of Fig. TS.23, Solomon et al. Figure 4. The spatial distribution of the water vapor feedback (W/m2/K) in (top) observations between 2000 and 2010 and (bottom) control runs of CMIP3 models. Adapted from Fig. 2 of Dessler . Figure 4 shows the spatial distribution of the water vapor fee dback in observations and in climate models.The model calculations are fundamentally a prediction because they were done before the observations were available. The agreement is excellent, and I take from this high confidence in the ability of the models to simulate this feedback. And given the importance of this process in driving climate change, I take this as a strong validation of the standard model generally. The standard model also explains the paleoclimate record. In the 1980s, my colleague Prof. Jerry North was trying to use energy balance models to simulate the ice ages and he just couldn't get the model to simulate those cold periods. Then, in the 1990s, ice core data showed that carbon dioxide was much lower during ice ages. When Prof. North included that reduction of carbon dioxide into the model, voila! —he could suddenly simulate the cold temperatures necessary to account for the ice ages. In addition, there are many occasions where the observations and the standard model disagreed, and it turned out that the observations were wrong. For example, in the 1980s, paleoclimate reconstructions suggested that the Tropics did not cool much during the last Ice Age, while the standard model found that to be inconsistent with the land-based data. More recent syntheses, however, have shown that the Tropics actually cooled more than previously thought—in good agreement with the standard model. Another example is the cooling observed in the MSU satellite temperature record in the 1990s. The standard model told us that cooling of the troposphere is inconsistent with surface temperature increases. But after corrections to the satellite data processing were made, they now both show warming. 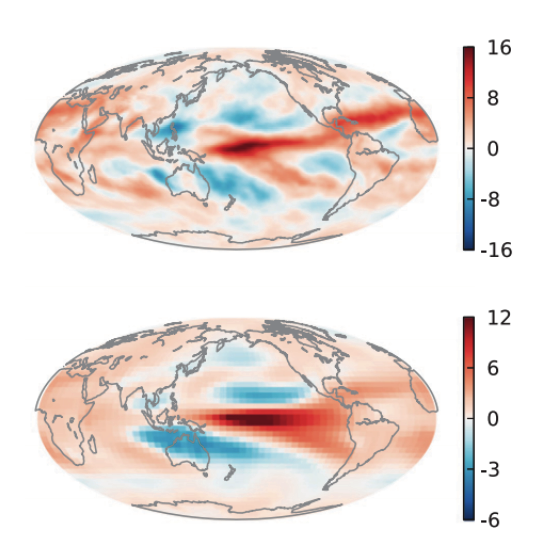 Disagreements between this data set and climate models still exist, but ongoing studies of the satellite record are uncovering more issues in it [e.g., Po-Chedley and Fu, 2012]. I suspect future revisions will bring it into ever-closer agreement with the models. Thus, we have a standard model of climate science that is capable of explaining just about everything. Naturally, there are some things that aren’t necessarily explained by the model, just as there're a few heavy smokers who don't get lung cancer. But none of these are fundamental challenges to the standard model. An excellent example of a challenge to the standard model is the so-called “hiatus”[Trenberth and Fasullo, 2013]: a lack of warming in the surface temperature record over the last decade or so. This is frequently presented as an existential threat to the standard model, but as I describe below that greatly exaggerates its importance. To begin, the lack of a decadal trend in surface temperatures does not mean that warming has stopped. Figure 2 shows the continued accumulation of heat in the bulk of the ocean, which is a clear marker of continued warming. And because heat can be stored in places other than at the surface, a lack of surface warming for a decade tells you almost nothing about the underlying long-term warming trends. More quantitatively, Figure 5 shows surface temperature anomalies between 1970 and 2013. 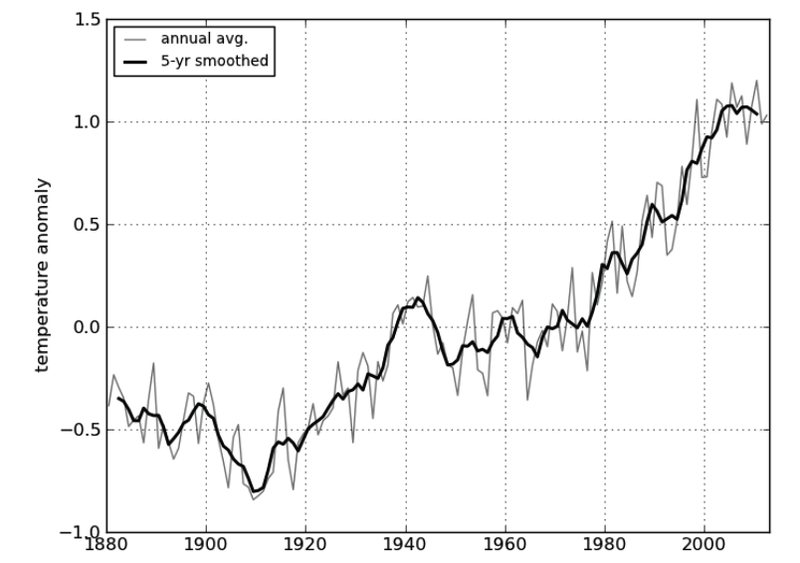 Over this period, the planet warmed rapidly, at a rate of 3°F/century. Also plotted on this figure are short-term trends based on endpoints that were selected to demonstrate short-term cooling trends. As you can see, it’s possible to generate a nearly continuous set of short-term cooling trends, even as the climate is experiencing a long-term warming. This would allow someone to claim that global warming had stopped or even that the Earth had entered a cooling period —even though the climate is rapidly warming! As Fig. 5 shows, the problem in very short temperature trends (like a decade) is that climate variability such as El Niño cycles completely confounds ones ability to see the underlying trend. However, this short-term variability can be removed, and, if one does that, then the hiatus essentially disappears [Foster and Rahmstorf, 2011; Kosaka and Xie, 2013]. Because of this, I judge that there is virtually no merit to suggestions that the “hiatus” poses a serious challenge to the standard model. Nevertheless, it would be wrong for me to claim that the standard model includes a robust understanding of the interaction of ocean circulation, short-term climate variability, and long-term global warming. Viewed that way, the “hiatus” is an opportunity to refine and improve our understanding of these facets of the standard model. Papers are already coming out on this subject [e.g., Kaufmann et al., 2011; Kosaka and Xie, 2013; Solomon et al., 2010]and I suspect that, in a few years, our understanding of this phenomenon will be greatly improved. Based on everything I discussed above, and more, the Working Group I report recently released by the IPCC concludes that humans are extremely likely to be the cause of most of the warming over the last few decades. Note that this does not claim that humans are the ONLY cause, nor does it claim that we are 100% certain. But given the amount of work that’s gone into studying this and the amount of evidence in support of it that has emerged, my view is that this statement is, if anything, conservative. As a consequence of our understanding of the climate system, unchecked greenhouse-gas emissions would lead to warming over the 21st century of 4.7-8.6°F 3 (for the global average). Regionally, on land and in the Arctic, the warming is apt to be larger. 3. Based on an ensemble of RCP8.5 runs. These warmings may not sound like much until you realize that the warming since the last ice age —a warming that completely reconfigured the planet—was 9°F-14°F (5-8°C). The upper limits of projected warming over the 21st century would therefore herald a literal remaking of the Earth’s environment and our place within it. Before I begin talking about impacts, it is worth discussing the value of talking about what we know rather than what we don't know. Focusing on what is unknown can lead to an incorrect perception of uncertainty. For example, we don't know the exact mechanism by which smoking cigarettes causes cancer. Nor do we know how many cigarettes you have to smoke to get cancer. Nor can we explain why some heavy smokers don't get cancer, while some non-smokers do. Based on this, you might conclude that we don't know much about the health impacts of smoking. But that's wrong. Despite these unknowns, it is certain that smoking increases your risk of health problems. In my judgment, those impacts and their magnitude are, by themselves, sufficient to compel us to act now to reduce emissions. And there are a number of impacts that may occur, but are not certain. We may see changes in drought intensity and distribution, and increases in flood frequency. And we have an expectation that hurricanes will get stronger, although their numbers might decrease. And there’s always the risk of a surprise, like the Antarctic ozone hole, where some high consequence impact that we never anticipated suddenly arises. We can argue about these less certain impacts, and scientific research in these areas is very active, but they should not distract us from those that are virtually certain. In conclusion, things are beginning to change rapidly. More and more frequently it seems we pass another climate milestone —hottest year of the modern temperature record, highest CO2in perhaps a million years, etc. Because of inertia in the climate system, every year we don’t take action commits us to about 2% more eventual warming [Allen and Stocker, 2014]. In other words, if we start taking appropriate action today, we can limit global warming to 2°C. But, if we wait 10 years to begin to reduce emissions, then the same level of effort will lead to warming of 2.4°C. Time is not our friend in this problem. By the time everyone agrees we have a problem, it is too late to do much about it. Allen, M. R., and T. F. Stocker (2014), Impact of delay in reducing carbon dioxide emissions, Nature Clim. Change, 4, 23-26, 10.1038/nclimate2077. Balmaseda, M. A., K. E. Trenberth, and E. Kaellen (2013), Distinctive climate signals in reanalysis of global ocean heat content, Geophys. Res. Lett., 40, 1754-1759, 10.1002/grl.50382. Dessler, A. E. (2013), Observations of climate feedbacks over 2000-10 and comparisons to climate models, J. Climate, 26, 333-342, 10.1175/jcli-d-11-00640.1. Dessler, A. E., and E. A. Parson (2010), The science and politics of climate change: A guide to the debate, Cambridge Univ. Press. Foster, G., and S. Rahmstorf (2011), Global temperature evolution 1979-2010, Environmental Research Letters, 6, 10.1088/1748-9326/6/4/044022. Hansen, J., R. Ruedy, M. Sato, and K. Lo (2010), Global surface temperature change, Rev. Geophys., 48, Rg4004, 10.1029/2010rg000345. Kaufmann, R. K., H. Kauppi, M. L. Mann, and J. H. Stock (2011), Reconciling anthropogenic climate change with observed temperature 1998–2008, Proc. Natl. Acad. Sci., 108, 11790-11793, 10.1073/pnas.1102467108. Kosaka, Y., and S.-P. Xie (2013), Recent global-warming hiatus tied to equatorial Pacific surface cooling, Nature, advance online publication, 10.1038/nature12534. Po-Chedley, S., and Q. Fu (2012), A Bias in the Mid-tropospheric Channel Warm Target Factor on the NOAA-9 Microwave Sounding Unit, Journal of Atmospheric and Oceanic Technology, 29, 646-652, 10.1175/jtech-d-11-00147.1. Solomon, S., K. H. Rosenlof, R. W. Portmann, J. S. Daniel, S. M. Davis, T. J. Sanford, and G. K. Plattner (2010), Contributions of stratospheric water vapor to decadal changes in the rate of global warming, Science, 327, 1219-1223, 10.1126/science.1182488. Solomon, S., D. Qin, M. Manning, R.B. Alley, T. Berntsen, N.L. Bindoff, Z. Chen, A. Chidthaisong, J.M. Gregory, G.C. Hegerl,M. Heimann, B. Hewitson, B.J. Hoskins, F. Joos, J. Jouzel, V. Kattsov, U. Lohmann, T. Matsuno, M. Molina, N. Nicholls, J.Overpeck, G. Raga, V. Ramaswamy, J. Ren, M. Rusticucci, R. Somerville, T.F. Stocker, P. Whetton, R.A. Wood and D. Wratt (2007),Technical Summary. In: Climate Change 2007: The Physical Science Basis. Contribution of Working Group I to the FourthAssessment Report of the Intergovernmental Panel on Climate Change [Solomon, S., D. Qin, M. Manning, Z. Chen, M. Marquis,K.B. Averyt, M. Tignor and H.L. Miller (eds.)]. Cambridge University Press, Cambridge, United Kingdom and New York, NY,USA. One of the key points is this: "What about alternative theories? Any theory that wants to compete with the standard model has to explain all of the observations that the standard model can. Is there any model that can even come close to doing that? *No*. I think there is an ambiguity here about the word 'models'. Most people will probably think of models as what climate modellers do, that is, mathematically predict values of key climate indicators using physical theory from physically possible values of greenhouse gas concentrations that are subject to conditions, such as how much fossil fuel we burn in the future. 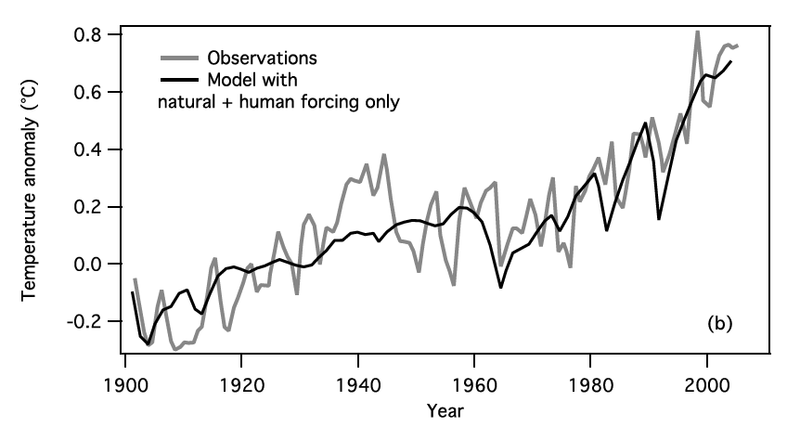 This type of modelling is an important part, but by no means the whole of climate science. But theory can never be tested directly: in every case there is a 'model' built from the theory that is instantiated using known data (such as values of physical constants) which may extend to a wide range of different lines of evidence. This model is less abstract than a theory. I think it's more in this sense that Dessler refers to the 'standard model' for which no competing theory exists. It's this model that answers the objection that the theory is somehow not 'falsifiable'. To take another contentious example, the 'model' of the theory of evolution covers multiple lines of evidence: the identified genetic, anatomical, physiological and biochemical relationships between organisms, the developmental biology of organisms, the fossil record and so on, as well as including the relevant chemistry and physics. No other theory accounts for all this (apart, maybe, from 'god created it to look this way'). Similarly, as Dessler points out, no other explanation accounts for the whole body (or standard model) of current climate change science and it is notable that there is no body of 'skeptics' building and refining an alternative model. 'Skepticism' consists largely, as far as I can see, of the continual circulation of a body of zombie memes that are never developed into a coherent model, indeed, these memes often logically contradict each other. This even after decades of development of the standard model. Thanks for that. The situation strongly resembles that in chemistry when Eli, as a young bunny, entered the field, forty years ago. At the time the hope was that observations could be inverted to yield a quantum level description of the molecule and/or reaction. What has been very successful is to build first principle descriptions of the molecular process which can then be run forward to model observations and then compare the model with the observations. Inevitably, global quantum models are lacking, or computational power is lacking although both have improved over the years, so we have some quantum chemistry models that do well on small things (molecules), others things like molecular modelling that are less quantum in nature that do well on bigger things (biomolecules), and, of course, some fiddling in the middle and on the edges. "... 4.7-8.6°F 3 (for the global average)." Observations are around 2.5 F per century. But extremists focus on extremities. "•more frequent extreme heat events"
No evidence that this is or should be occurring. Heatwaves are DYNAMIC events caused by intense subsidence inversions. Variances from the mean should, as Tamino demonstrated, remain about the same. "•changes in the distribution of rainfall"
When was the distribution ever constant? Why do we have any belief in long term precipitation forecasts? Yes. Around 3mm per year, about one of which is from ground water use. You guys building an Ark yet? "•the oceans becoming more acidic"
visceral response amongst the public and the mouth breathing senators. Look, fun is fun - who doesn't like a good monster story? has been a waste of time promulgated by lies of exaggeration. Of course, some love a good extrapolation when it suits them. Do you think the National Academy of Sciences is taken in by lies and exaggeration? First, climate change is already having some significant consequences in terms of extreme weather events, crop losses and fires. Ask the Aussies. Second, the physics says things get a whole helluva lot worse as the temperature rises. Third, things really start to get bad precisely at the time global population is projected to crest around 10 billion people in 2080. Finally, if you knew anything about risk management you'd know you have to plan for a worst case at some confidence level. Go ask your mommy to explain. ""•the oceans becoming more acidic"
I'm guessing he means less alkaline..."
Congratulations sweetie, you just demonstrated your complete ignorance of scientific terminology relating to pH. Why, I'd bet that you don't even know what pH means. See, there's the problem - you're guessing, probably because you have nothing in terms of scientific understanding with which to work. 'Less alkaline' is the same thing as 'more acidic' irrespective of the definition of neutrality. Aninnymess is behind the times if he hasn't yet cottoned on to this early high school chemistry lesson. Rib Smokin' bunny uses blood acidosis and alkalosis as examples in his class on buffers. Those stupid doctors, calling it acidosis when the pH is still above 7! When I see someone laughing at 'ocean acidification' as a reason to doubt man-made climate change, that's a key indicator you can ignore that person. Or ridicule them, your choice. Yes, I agree with Rib Smokin' bunny, "Those stupid doctors, calling it acidosis when the pH is still above 7!" 6.8 is still compatible with life. Acidity is easy to define based on the pH scale, which, just to be a pedantic little lagomorph, is the negative of the log to the base 10 of the concentration of protons (e.g. hydrogen nuclei) in solution. The alkalinity of a solution is rather more slippery because it is defined as the amount of the solution needed to neutralize acids, but this can involve all sorts of complex acid-base equilibria if weak acids/bases and salts of the same are in the solutions, e.g. sea water. Eli senses a post coming on. I thought I'd just post a comment I made on this testimony in a mailing list on the philosopher of Karl Popper and infested by so-called 'skeptics':"
Routine. If the evidence is not on your side, switch to philosophy. That is, use these words (in order of popularity) "falsification", "paradigm" or "demarcation." Eli is right. I should have said "basic" rather than "alkaline", and the embarrassing thing is that I actually had it in my head to do so. I can only offer the "don't think of a pink elephant" defence after reading the troll's comment. "When I see someone laughing at 'ocean acidification' as a reason to doubt man-made climate change, that's a key indicator you can ignore that person. Or ridicule them, your choice." Rich coming from a salesman of 'green infrastructure'. You wouldn't have any monetary obstacles to your pursuit of the truth now would you? "First, climate change is already having some significant consequences in terms of extreme weather events, crop losses and fires. Ask the Aussies." Things which have always happened are not indications of something new happening. "Second, the physics says things get a whole helluva lot worse as the temperature rises." The physics says warming should continue at a somewhat lesser rate ( GHG forcing growth peaked some 25 years ago ). Warming is not calamity or even harm. "Things which have always happened are not indications of something new happening. then "something new is happening". Such is the case in my part of Australia. "The physics says warming should continue at a somewhat lesser rate (GHG forcing growth peaked some 25 years ago )." For giggles how about you reference the "lesser rate" at which warming is expected under the business-as-usual fossil fuel burning for the next few centuries. "Warming is not calamity or even harm." Assertion. That's a logical fallacy. References please, including of those that refute the literature that says that warming over 2.5-3 C is harmful. And don't be lazy - get a name. It's not the warming per se that is the direct harm, sweetie, it's the warming exacerbated drought, crop failure and ensuing famine that you need to worry about, not that I expect you to. "it's the warming exacerbated drought, crop failure and ensuing famine that you need to worry about,"
And you believe that because...??? You do know that drought, in the US anyway, has become LESS frequent, don't you? What part of drought do you imagine is caused by temperature? The significant droughts of history have been caused by lack of precipitation. Why would you think that precipitation would decline? You do know that global crop production continues to rise, don't you? Believing hysterical lies does not lend you credibility. Now that is extremely insightful and profound. Very deep. Bravo! You have outdone yourself again. Oh, sweetie, one has to give you credit for peddling as fast as you can. "And you believe that because...???" Because drought and famine kills people, sweetie. Always has. Guess what happens when the rains fail, sweetie: it gets hotter. Hot enough to bake the soil dry and turn it into hard, cracked pancake. And once the soil is dry none of its heat can be given up as latent heat of evaporation, so it gets even hotter. That's why drought is almost always accompanied by higher temperatures. "You do know that drought, in the US anyway, has become LESS frequent, don't you?" So typical that you would only mention the US, sweetie. Tell that to Australia, but even in the US, try telling it to Texas, Oklahoma and currently California. "Why would you think that precipitation would decline?" Because that is exactly what is expected in continental interiors as global temperatures rise, sweetie. You need to pay attention. "Believing hysterical lies does not lend you credibility." Peddling lies gives you no credibility at all, sweetie. "Because that is exactly what is expected in continental interiors as global temperatures rise, sweetie. You need to pay attention." So higher temperatures suppress precipitation? Which equation is that? Where do you think rain comes from, sweetie? In continental interiors there's less water to evaporate in the first place, and once the soils heat up and dry out there is still less water to evaporate. Honestly, you could at least try to understand that which you so readily dismiss out of ignorance. "In continental interiors there's less water to evaporate in the first place, and once the soils heat up and dry out there is still less water to evaporate." The water vapor which produces precipitation is overwhelmingly advected from the oceans. It is falsehoods such as this which continue the hysteria. See also : Oceanic and terrestrial sources of continental precipitation. Reviews of Geophysics, v. 50, paper no. RG4003, doi: 10.1029/2012RG000389. Oh sweetie, what Thomas Lee said. Obviously you have never read anything about rain forests or Hadley cell circulation. If you think there is a conflict between the drying of continental interiors and water vapor advected from the oceans then you are dumber than a sack full of hammers. You will find that most precipitation coincides with moisture plumes and waves from the oceans. Without water vapor from the oceans, how much rain would fall on the continents? And how are you going to stop increased water vapor from falling as rain on the continents? "most precipitation coincides with moisture plumes and waves from the oceans." Well duh, sweetie, it's called monsoon. And agriculture in many parts of the world depends on its stability and predictability. In fact, life itself depends on it in vast regions of the world. It's bad enough that ENSO already periodically wreaks havoc on that predictability. What happens when the monsoon does not arrive when it usually does, or even fails to arrive at all? Think Ethiopia 1983–85 and again in 2011. Think India 1876-78 and again in the 1890s. A warming world is an unstable world, and therefore an unpredictable world. The monsoon doesn't have to fail completely to wreak havoc, just shift its intensity, timing or geographic distribution. You think continental interior drying can't happen? Think Anasazi, Mayan, Khemr, and Akkadian civilizations. Think the Russian heat wave, fires and wheat crop failure, the Pakistani flood and rice crop failure, and the Australian drought and flood and general crop failures, all in 2010. We can cope with a single year like 2010. We can't possibly cope with a new normal like 2010.